Oh my goodness! Husband and I recently had a wonderful meal at Five Senses restaurant in Murfreesboro, Tennessee quick overnight trip, and after a late and satisfying lunch on the way at Miss Annie’s Rustic Park Restaurant and Beer Garden in St. Joseph, Tennessee, it was later in the evening before we started thinking about eating again. (Oh, who am I kidding? When we’re on the road, I always think about eating.) The ‘Boro has some great choices, and since we still mourn the loss of downtown pizza place “Tomato, Tomato,” we picked its upscale sibling Five Senses. Or, rather, JP picked it and I agreed. It was either Five Senses or Red Robin, and while I always enjoy working my way down a tower of fried onion rings, we made the correct decision here. We went with small plates instead of entrees and so started with three appetizers: fried oysters, Readyville Mill grits and a crabcake, all flavorful and with lovely sauces and little salads. Then Husband JP had a wedge salad, which he was delighted to see came in deconstructed form so he could play with his food, and I had a salad with fresh local lettuce. And then, dessert. Oh my oh my. Usually creme brulee is my go-to, but JP talked me out of it with a suggestion to try something new. 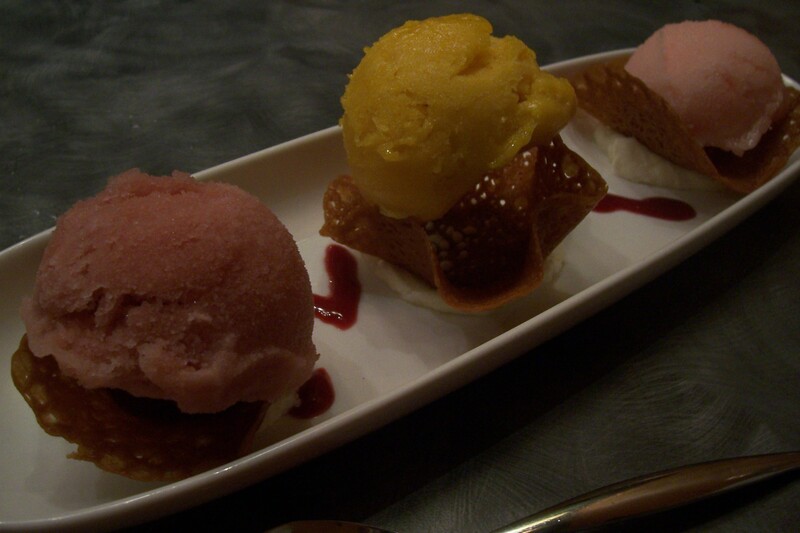 Thank you, dear sweetie, because this trio of sorbets — pomegranate, mango and pink grapefruit on crispy lace cookies “glued” to the plate with homemade whipped cream — was absolutely divine. Every bite was cool, creamy, tart or sweet. And, honestly, to tell the truth, as much as I adore creme brulee and would eat it every day except that it’s like 10,000 calories per bite, the best part is the contrast of the crunchy sugar top with the smooth richness underneath. When that’s gone, it’s still good but bordering possibly on sameness. However, every bite of this sorbet — every single bite — was an adventure. As it always is when I go out with my husband. This entry was posted in Alabama, family, food, Tennessee, travel and tagged cooking, Crème brûlée, eating, food, home, Murfreesboro, pizza, Readyville Mill, restaurants, Salad, shopping, Tennessee, travel by Coffee with Cathy. Bookmark the permalink. Haven’t been there in a while, well maybe longer. Since before they closed because of the highway move/rebuild. Yeah, it seems like it took forever for Miss Annie’s to re-open. We thought the food – catfish basket for me, grilled chicken for her – was “better than it needed to be,” as we like to say. Main thing, the beer is on tap and cold. Mary — Annie’s is worth the drive — and it’s a very smooth drive now! 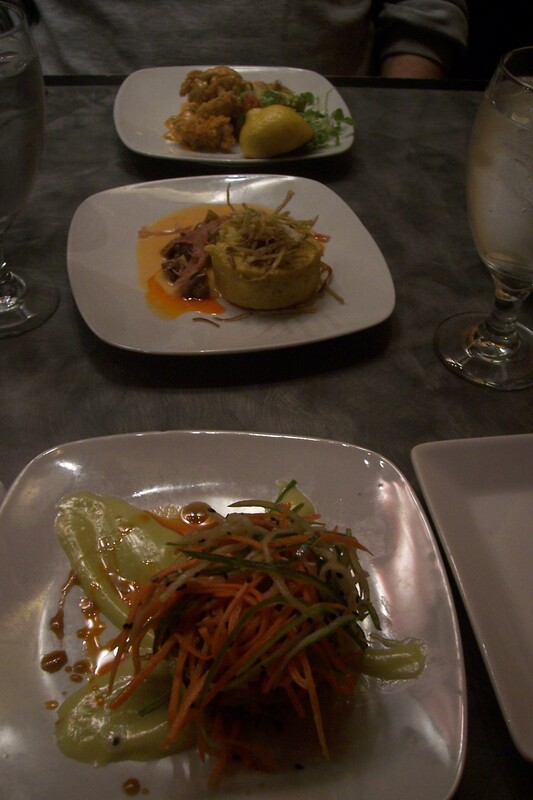 The food hasn’t always been the best, but this past time we were there it seemed to be better. And as JP says, the beer is draft & cold! I want to speak in praise of the wedge salad I had at Five Senses. It’s te small salad photo on the right. 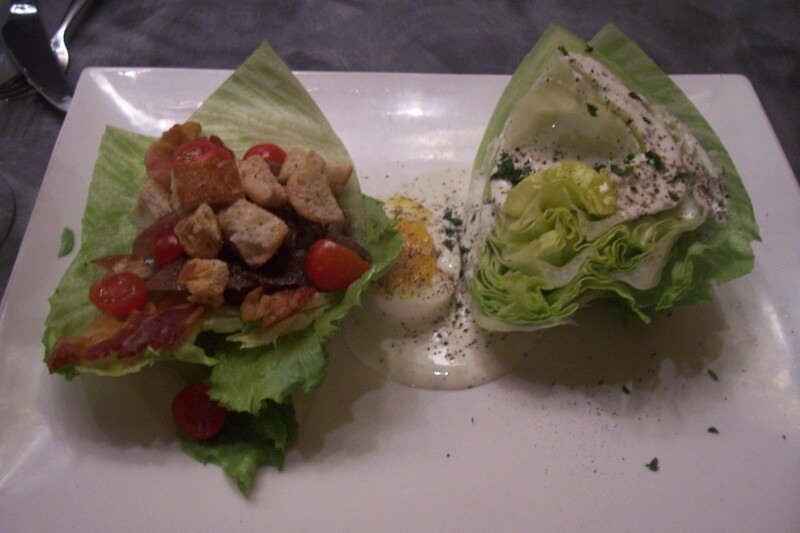 For lack of a better description, it’ a deconstruction of a wedge salad, with all the extras – tomatoes, croutons, onions, bacon – served on a leaf of lettuce on the side. I liked it.